Thanks in good part to our critics, our paper Quantifying the consensus on anthropogenic global warming in the scientific literature keeps getting more attention. It almost seems that you can’t open up a browser without seeing the “97%” meme somewhere. The extra interest prompted by Richard Tol’s recent critical article has maintained the rate of downloads of the paper at 500 per day and has pushed the total to nearly 200,000. The recent buzz has also spurred discussions on And Then There’s Physics, Variable Variability, Twitter, in The Guardian and a renewed line of criticism in a series of articles by Yale University Professor Dan Kahan. I was surprised—a little shocked even—at some reactions to the release of our consensus paper. I was prepared, of course, for an angry response from those people who maintain that the expert consensus on the basics of anthropogenic climate change is either non-existent or crumbling. But my colleagues and I were never expecting to change their minds. However, strong and sharply-worded opposition was unexpected from people like Dan Kahan (sarcasm), Mike Hulme (“infamous”), some journalists (“unwarranted attention”) and some climate scientists (satire), none of whom actually dispute the existence of an expert consensus on the basics of anthropogenic climate change. That the criticism often seemed tinged with peevishness (at least before they did some back-tracking) was especially surprising. I never saw our work as in any way undermining their approaches and analyses, but rather complementing them. And the complaints continue. The apparent anger and the throw-everything-at-the-wall criticism suggest that this is something other than a measured scholarly critique. Let’s first look at the main strands of argument in a bit more detail. Putting aside, for now, the objections from people who deny that an expert consensus even exists, the main objections to the idea of consensus messaging are below. These are generic objections and don’t come from any single critic. The objection summaries are initalics, rebuttal one-liners in bold. a) Everybody already knows. Except the 88% who do not. 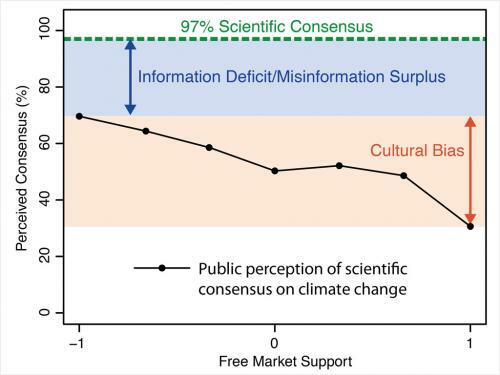 As John Cook’s figure below shows, even the most left-wing people underestimate the extent to which scientists agree. There’s an element of cultural bias and an element of what Michael Mann and John Cook have called a “misinformation surplus”. 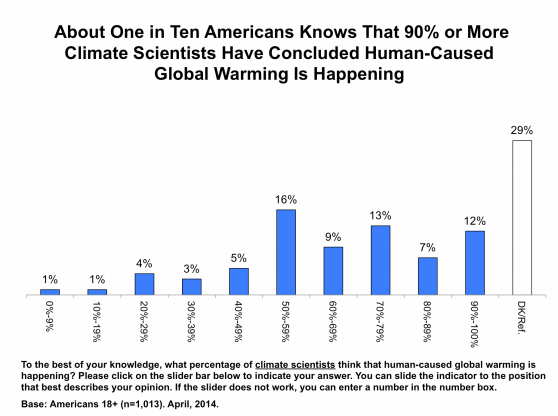 Also, independent studies show that only 12% of Americans are aware of the correct degree of agreement among climate scientists. b) It’s divisive. Consensus is a fact, not a moral judgement. It is likely that people who have their minds firmly made up that AGW is a non-existent problem resent being told that the experts do not agree with them. If consensus messaging is a rhetorical bludgeon (as some have said) then it may well just hammer contrarians deeper into the holes that they find themselves in. 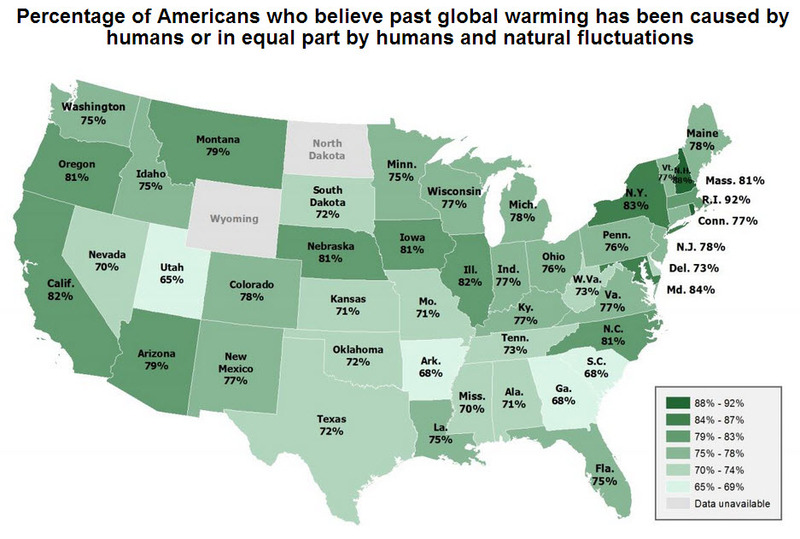 But some surveys reveal, as shown in the map below, that at least two-thirds of Americans believe that half or more of global warming has been caused by humans. How divisive can it be to inform, let’s say, 75% of people in Louisiana, that their general viewpoint is backed by the overwhelming opinion of scientists? There is, of course, genuinely divisive discourse in the climate debate. One tactic is to draw exaggerated moral comparisons between one’s opponents’ beliefs and the discredited beliefs of the villains of history; for example, see Roy Spencer’s Nazi rant or Al Gore comparing climate skeptics to racists. Singling out “97% messaging” for being an” insult” in what is already a toxic rhetorical environment seems perverse and even, in itself, rather overblown and divisive. c) It’s not relevant. Scientific consensus provides reliable knowledge for non-experts. It is obviously true that the existence of an expert consensus on any scientific theory does not constitute any kind of logical proof that that particular opinion is correct. We have never claimed that it is. Philosophers can relax. Some scientists do not see the point in examining consensus. Researchers in any field are about as aware of the prevailing consensus as fish are of water: they are so immersed in it that they no longer notice it. Consensus is the reliable knowledge that goes into the undergraduate textbooks, whereas researchers, naturally, tend to focus on the areas that are not generally deemed settled. However, non-experts confronted with a choice as to what to accept as reliable knowledge—and, since the Enlightenment, we are all of us non-experts in most areas of knowledge—have to take someone’s word for it. Even though nobody just blindly accepts expert opinion—especially if that evidence is counter to our senses or challenges our social identity—the received opinion of people who know much more than we do weighs heavily in our considerations. This presentation by Naomi Oreskes is worth watching in full, but at just past the 14 minute point she deals with the value and significance of consensus in science and the question of the appeal to authority. d) It’s ineffective. Countering manufactured doubt is not easy. This is probably the strongest argument against consensus messaging—it simply may not work. We know from the literature that acceptance of consensus correlates with support for policy, for example, from Ding et al. and McCright et al. We learn from Lewandowsky et al. that consensus acceptance may not just correlate with policy acceptance, it might cause it. Despite this scholarly support, I remain a little doubtful. These kinds of study usually look not at the climate of opinion (trends over decades), but at the weather of opinion over the short elapsed time of the study. Also, the experiments are necessarily conducted in controlled environments, not in the noisy real world. The indications are encouraging, but they are not enough; we need to see a real opinion shift and we have not, yet. I am encouraged, though, by the way the consensus messaging idea has been embraced outside of the academy. The idea has been adopted enthusiastically, if not always accurately, by politicians, including President Obama. Every utterance that Obama makes is screened by the best communication experts that money can buy. Well, maybe he has only the second-best advice money can buy, since the consensus messaging strategy was earlier employed by The Republican Party as a means of effectively casting manufactured doubt on climate science to justify policy inaction, by communications guru Frank Luntz. e) It’s a distraction. 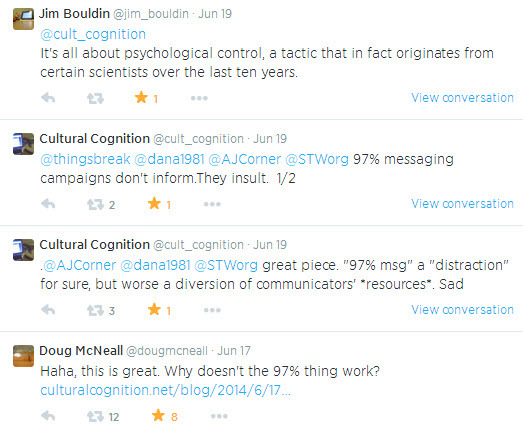 Consensus messaging complements, but does not compete with, cultural messaging. We all seem agreed that a two-channel model of science communication “that combines information content (“Channel 1”) with cultural meanings (“Channel 2”)” (Kahan) is probably the best path forward. It’s true that the volume of reaction to our paper seemed sometimes as if the amplifiers were set to eleven, making it hard to hear the other channel. Perhaps, rather than muting the information content/consensus channel, it would be better to turn up the volume knob on the cultural channel. Which leads me to my final point. At an early stage of my industry career an older colleague told me something like: “You may think we are just doing a technical job, but, really, we are all in sales”. As somebody who was happy keeping my head down interpreting geophysical data and who hated the whole idea of salesmanship, this advice seemed a little cynical. Later, I came to accept that he was right. It didn’t matter how cool your idea for a new exploration prospect was: if you couldn’t explain it, if you couldn’t persuade people to act on it, if you couldn’t sell it, you might as well have never had it. For my colleagues and I, getting our research published in a peer-reviewed journal was a necessary first step. But we wanted to go beyond this, to promote the ideas beyond the readership of scholarly journals. This involved presenting the material in an accessible way on a dedicated website ,which was designed and built with the generous, pro-bono assistance of communication professionals SJI Associates. We also used our network of volunteers to promote the study on social media and in the mainstream press. We were successful beyond our expectations and the whole effort cost us nothing but time. There have been some excellent examples of science communication to the general public recently: the superbly executed Years of Living Dangerously documentary series; Neil deGrasse Tyson’s excellent Cosmos shows; and the very clearly written and beautifully laid out Third National Climate Assessment prepared by American scientists with the help of communications specialists. These efforts have rightly attracted huge public interest. They are rich in information, presenting consensus scientific information effectively and forcefully. The central idea of cultural cognition is that attitudes and opinions that people adopt are as strongly influenced by their cultural values and identities as they are by objective fact. Mike Hulme explored the connection between culture and climate in his book Why We Disagree About Climate Change. Dan Kahan has researched the links between social and political identities in the USA and attitudes towards many issues, climate change included, where opinions sometimes divide along political lines and sometimes don’t. There is a great deal in this work that is valuable and ought to be very widely known. Unfortunately, judging by the polarized and entrenched political discourse that prevails in the climate debate, from all sides, few seem to be buying it. Why? Perhaps because there has been no concerted effort to sell it, at least to the general public. There is no sticky message, the writing is often impenetrable to the layman, there are no good graphics or cool websites, no soundbites, no hooks, no stories. The prescriptions, to the extent that there are any, are worthy, but fall flat: “effective strategies include use of culturally diverse communicators”; “we should use climate change both as a magnifying glass and a mirror”. How can anyone expect those kinds of messages to grab attention in the modern world? This is not a zero-sum game in which there is a small pool of attention that has to be fought over. John Cook’s team’s relative success in selling its ideas is not the reason that other, complementary approaches are not getting the public attention that they deserve. Despite my disappointment with the tone of his criticism, I am a fan of Dan Kahan’s work and I think he provides many insights on why we adopt the positions we do, and he exposes the fallacies of some common-sense explanations of how and why we form opinions. I wrote a long blogpost at Skeptical Science based on one of his papers in which I tried to explore what his results meant to those of us who were attempting to communicate climate science to non-specialists. He changed my mind on the “information deficit model”, the idea that to influence opinions on climate change the most important thing that you have to do is present the facts. Indeed, I had an information deficit about the information deficit model that Dan Kahan filled, recursive though that sounds. I also like Dan personally and we have had constructive and friendly exchanges on blogs and by email. 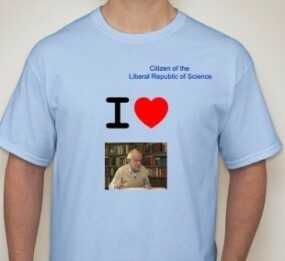 He even gave me a nice T-shirt with a picture of one of my heroes, Karl Popper, on it. Sadly, I am not allowed to wear it outside the house. "If you are looking for someone who understands the science (more or less) and simultaneously has concluded that there isn't such a big problem, I'm afraid your search will be in vain, not least because the existence of the first probably precludes the possibility of the second." ...non-experts confronted with a choice as to what to accept as reliable knowledge—and, since the Enlightenment, we are all of us non-experts in most areas of knowledge—have to take someone’s word for it. ...Forget that dream about enabling the public to independently evaluate scientific claims on their merits – that’s just not going to happen. Instead, enable the public to distinguish between reliable and unreliable sources of scientific information. Now, if science meta-literacy includes understanding how consensus is reached in science, then whether it's 88%, 95% or 97%, the lopsided consensus for AGW places it far toward the Einstein end of N-G's crackpot-Einstein scale. Especially now that the National Academy of Sciences and the Royal Society have jointly endorsed the major aspects of the consensus, a science-meta-literate non-expert can be satisfied that "the science is settled" enough to guide public policy. > How can anyone expect those kinds of messages to grab attention in the modern world? Upon what published theory of climate change does this consensus agree? Surely this theory is published and referenced specifically in the articles surveyed. If not, then how can there be a consensus? There is a well-developed theory of climate. See Pierrehumbert's text, e.g. The sorts of climate change we expect are constrained by this theory. Small and benign changes for very large forcings are indeed theoretically excluded, and the relevant theoretical basis is essentially entirely a subset of well-established physics. Hope this helps. "Jacoby's colleague John Reilly told me the price of gasoline might rise by 25 cents a gallon in the first year. Over time, that would increase. By 2050, Reilly figures the carbon tax would add about $1 to the price of every gallon. Across the economy, prices of energy-intensive goods and services would rise. This would encourage people and businesses to be more efficient." A whole dollar per gallon by 2050! Oh dear. Compare: in the UK, a litre of petrol is £1.30 - that's £4.92 a US gallon. 61% is tax i.e. 79p per litre or £3.00 per gallon. ($5.11 at current rates). In the US it's something like $3.70 per gallon, right? So a dollar tax...? It's currently 18.4 cents. A dollar tax would take that up to $4.52 - i.e. the tax would be ~22% of the fuel cost (at current prices, which is what I presume they're comparing to, i.e. it'd be the equivalent of today's dollar in 2050). Yes, we've seen some efficiency gains, as has the rest of Europe, from having higher fuel duty. But that's from massively higher tax than even the 2050 amount suggested in that article. If we're not seeing the magic of the market produce low carbon outcomes at 61% duty - and haven't done, as fuel taxes have been this high in many countries for a long time - why would anyone think a 22% tax would be so effective? Without effective infrastructure transition planning - rather than the shambolic approach we're still taking - fuel inelasticity won't change. People need to get to work, organisations need to consume transport - and transport input cost for most business is so low, taxes would have to be raised insanely high to impact on them. So high fuel taxes have been tried in many countries and most of Europe - much higher than the US appears to deem politically acceptable even by 2050. That clearly won't work alone. Taxes, yes - but if anyone thinks taxes alone can solve this problem, they're dreaming. If the US adopted European taxes on fuels and the country adjusted by cutting its oil consumption by more than half to current European per capita levels, that would take about 10 million barrels per day of demand off the market, about a Saudi Arabia's worth. Probably more important than a carbon tax on liquid fuels would be a tax on coal. The carbon price in Europe currently stands at about 7 Euros/tonne CO2 (US$10/tonne)under the EU Emissions Trading System, I think. (That number was for February 2014). The NPR article didn't mention how much the carbon tax would be, but BC's carbon tax of $30/tonne adds about 7 cents per litre to gasoline, so a dollar a US gallon would involve need a $100/tonne price, some ten times what Europeans are paying now on emissions. That would make a huge difference to renewables, spur efficiencies and even make some CCS projects economic. There's little doubt that, if adopted globally, this would greatly reduce demand for coal and oil and it would almost certainly mean the end for high-emissions, high-cost oil production in the oil sands, for example. That said, I think we will need more than a heavy carbon tax to hit safe levels of emissions (ie zero) in a few decades' time and there will also have to be huge government support for R&D and infrastructure. A change in the culture of consumerism would be helpful, too. According to this, many firms are already looking at high carbon prices to guide investment decisions. Every time we use a computer, turn on a light, drive a car, use a refrigerator or stove or plumbing, to name a few, we rely on the expertise of others without having to establish an understanding of the underlying principles that make these things work. So much special pleading these days seems to have a microfocus on preventing rather than advancing discussion. Some common knowledge needs to be assumed to get on. That said, I have to thank Andy Skuce for making me take a harder look at Dan Kahan, whose sniping I find annoying. While I accept some of his ideas, they are often used as distraction like all the other points. For example, recently we had a whole dingdong on whether the word denial means denial as in a dictionary or carries all kinds of baggage that we all have to accept so we cannot use the word to describe what it describes. This kind of distraction has been developed to a fare-thee-well. It's used in a very one-sided way. It may be frustrating to see the shiny impervious surface presented by opponents to knowledge, but taking these attacks seriously and making a circular firing squad does not help us all face outwards. Sometimes, having science as a background to my entire life, I find it confusing that people impute so many motives that have nothing to do with the investigation of reality that is at the core of it to its practitioners. We could argue that "blue" is an artificial construct, or we can admit that the sky is normally blue on a cloudless day. It's a convenience to understand that when a large group of experts have studied a subject with a wide range of ideas and techniques over a longish period of time agree, that makes it extremely likely that we don't need to reinvent the lightbulb here. > So high fuel taxes have been tried in many countries and most of Europe - much higher than the US appears to deem politically acceptable even by 2050. That's a good point, but tangential with what I had in mind. The point I had in mind was not about the content of the proposal, but its packaging: a one-page solution. This might be needed first and foremost, before any merry-go-rounds about decimals of how much to tax and when. Of course, details matter. But details never really matter for what's we're shooting for in science communication. We should bear in mind that there's an infinite way to raise concerns about what is said for public consumption. There's little we can do about that. Audits never end. The point in the talk was to remind ourselves of basic economic principles. A neutral carbon tax, or anything else by which the same basic economic principles kick in, may only provide the necessary part. Of course, the economist may have went a bridge too far in suggesting that it would be sufficient. Of course, of course. It may be tough to communicate in a clear and concise manner without the use of an hyperbole. But I'm willing to be convinced otherwise. What would you suggest we should write on that one-page solution, Dan? Pierre Humbert's book does constitute a published theory of climate change. This 97% consensus does not cite any theory upon which to base a "consensus". A consensus requires agreement, but the papers research in the survey declaring such a consensus do not agree upon any theory. They rarely even cite a paper when mentioning climate change. It's appears to a basic catch-all used in these papers to tie into climate change funding. If there were citations to a particular published theory, then there might be a basis for consensus. Until then it's a consensus that many things are possible. There is absolutely no point in posting any type of a comment on this site since they are either being scrubbed (as in never allowed to be posted) or they take so bloody long to be approved (and thereby absolutely killing any possible debate or discussion). So when you talk about how to get the message across - I strongly suggest you examine your own miserable failures with this website. I won't be back and I'm a HUGE writer discussing climate issues (thousands upon thousands of posts). While I'm not sure exactly "who" edits this site - it leave a hell of a lot to be desired.